Even if you don’t have a ridiculous amount of money to blow on stupid garbage, everybody loves a good auction of pop culture memorabilia. Where else can you get a shirt with a bird on it that was worn by a guy on TV, or a stapler you may have seen in the background once, or an opportunity to be buried in a famous grave? An auction of TV props is going to happen at the beginning of next month, and while it doesn’t have a famous gravesite or a bird shirt, a single item makes this one of the most absurd/cool/absurdly cool memorabilia auctions in a long time. That item, as spoiled by the headline of this story, is none other than Laura Palmer’s casket from Twin Peaks. Yes, for a starting bid of only $1,000, you could have one of the weirdest, most bizarre things that anyone has ever bought in the history of buying things. 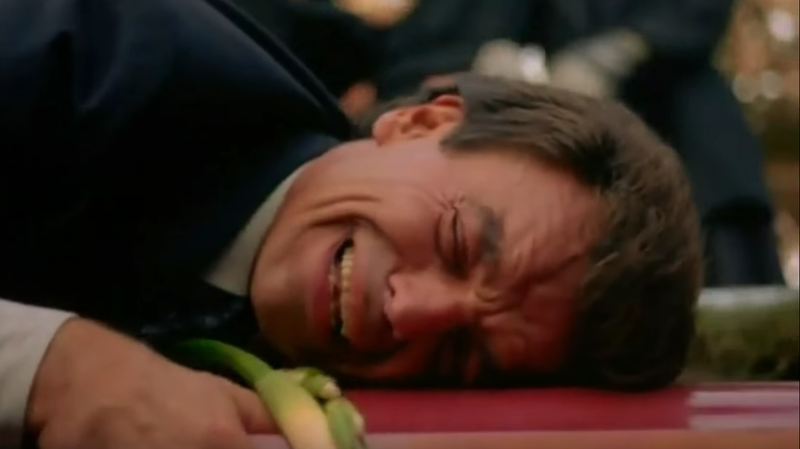 Remember Laura Palmer’s funeral scene in the original show, where her father jumped on top of the casket as it was lowered into the ground? This is that casket, and now you can jump on top of it and pretend you’re Leland Palmer, like some totally normal person who we would never even think about judging for buying such a weird thing. Seriously, though, what would someone do with it? Unless they own a TV museum, would they just keep it in their living room and constantly explain to people that it’s from Twin Peaks? We’d really like to know, but also, we really don’t want to know. Casket aside, the auction has some other cool stuff, including a plaque that hung on Fox Mulder’s office in The X-Files indicating that he’s a “technically trained agent,” a fake head burned by acid, one of those red alien suits from V, a pair of the Hulk’s pants, some copies of The Daily Planet from Lois & Clark, Howard Stern’s Fartman costume, fake Muppets from MadTV, the helmet and arm cannon used by the Orkin’s old cyborg mascot, a mountain of Star Trek costumes, Frank Gorshin’s Riddler jacket from Batman, a bag of Breaking Bad meth and some of Jesse Pinkman’s “smoking paraphernalia,” and—best of all—an Emmy nomination certificate for X-Files makeup artist Mark Shostrom. Why is that the best of all? Well, just imagine how awesome it’ll be to put this on your wall if your name is also Mark Shostrom. It’s the ultimate Christmas gift (for someone named Mark Shostrom). You can find all of the listings at this link, and the auction itself begins on December 1.